Amir Khan's trainer, Freddie Roach, has said that he knows the "mystery man" who was seen at ringside during the Briton's controversial world title defeat by Lamont Peterson last month – and does not believe that he is an International Boxing Federation official. On Thursday, Khan used his Twitter account to post a series of images of the man, who was seen to be wearing a dark hat, in order to draw attention to the man's movements around the judges' table during the fight in Washington last month. Peterson won Khan's IBF and World Boxing Association world titles after a disputed points decision. Richard Schaefer, the chief executive officer of Golden Boy Promotions, said on Saturday that the man had been identified as Mustafa Ameen, an IBF official who was given accreditation for the fight despite not being directly involved in it. However, Roach says he knows Ameen and that he had no need to be at ringside. "He comes to my gym," Roach told BBC Sport. "He came to the US Olympic training centre and I actually had him removed one time. I told the coaches, 'There's no need for him to be here'. "He goes to gyms and talks to other people's fighters. But he does know the boundaries because he doesn't go after my fighters – but he does talk to other people's fighters and he's been told not to a couple of times, even here in my gym. "Ameen has no credentials; he's not a member of any boxing organisation. 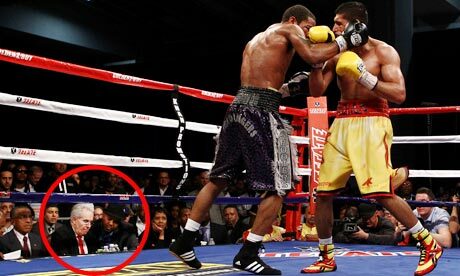 There's no reason for him to be at ringside. Why he was ringside and why he was in the ring afterwards celebrating and so forth I have no idea." Schaefer also said on Saturday that the WBA had offered Khan a rematch with the American, and urged the IBF to follow suit. Roach agrees that because of the possible interference the fight should be declared a no contest and a rematch held. He said: "You've got a guy sitting beside Michael Welsh, World Boxing Association supervisor that's talking about who's winning rounds and so forth – we can only speculate on what they were talking about but most likely they are talking about the fight. And people get influenced by other people easily. And that's why the rules are that no one but officials are at ringside."